The Covington/Conyers Choral Guild (CCCG) is committed to promoting excellence in choral music and seeks to support students who have chosen to pursue music as their future vocation. We are pleased to offer a scholarship program for 2019 graduates of Newton and Rockdale County public schools, private schools, and homeschools. Scholarships of up to $1,000 will be awarded based on the student's academic and artistic achievements, teacher recommendations, and financial need. 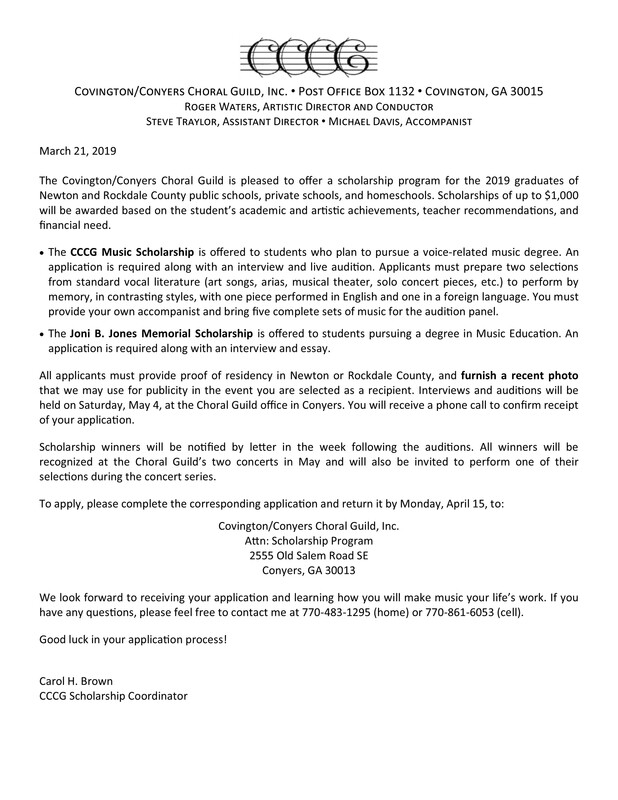 The CCCG Music Scholarship is offered to students who plan to pursue a voice-related music degree. An application is required along with an interview and live audition. Applicants must prepare two selections from standard vocal literature (art songs, arias, musical theater, solo concert pieces, etc.) to perform by memory, in contrasting styles, with one piece performed in English and one in a foreign language. You must provide your own accompanist and bring five complete sets of music for the audition panel. ​The Joni B. Jones Memorial Scholarship was established by her husband, Mark Jones. Joni was the Assistant Director and Accompanist for the Covington/Conyers Choral Guild for 30 years, until she lost her battle with cancer on May 30, 2016. This scholarship is offered to students pursuing a degree in Music Education. An application is required along with an interview and a brief essay entitled "The Important of Music Education in Today's Society." All applicants must provide proof of residency in Newton or Rockdale County, and furnish a recent photo that we may use for publicity in the event you are selected as a recipient. Interviews and auditions will be held on Saturday, May 4, at the Choral Guild office in Conyers. You will receive a phone call to confirm receipt of your application. The following documents are available to download to assist you in your preparation for the upcoming 2018-2019 Scholarship Application process. If you have an interest in supporting aspiring musicians, please contact Carol Brown, Scholarship Coordinator, to find out how your tax-deductible contribution can assist us in providing this scholarship program.